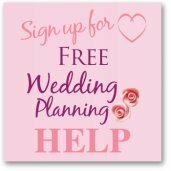 Having a wedding candy buffet is a really cute and fun idea to have at your wedding and there are so many different ways that you can create a stunning candy display. They look great and taste yummy which has to be the perfect combination! There are a number of companies that have started to supply candy buffets and they do look great but they can end up being expensive. So it is worth costing out how much it would cost you to put together your own candy buffet. To create your own candy buffet you will need candy, containers to display the candy, scoops and paper bags or cones for your guests to take the candy away in. Some couples choose to have a candy buffet instead of a dessert and a candy buffet is a great alternative to a cheap wedding favor, so both ways you will save money. Which we all like! How Much Candy For A Candy Buffet? Let's start with the basics! You don't want to buy so much candy that you have loads left over but you also don't want to run out. 100 x 4oz = 400oz divide by 16oz (as that is how many are in a lb) = 25lbs of candy! Sounds like a lot but that amount of candy will make an impressive display. If you want to have a variety of candy it is a good idea to put the candy you know will be the favorites into bigger jars and then user smaller containers for the candy you want for the overall color effect rather than the popularity! I also know of some brides that have placed empty boxes into large jars and then filled the candy around the box, this results in you looking like you have more candy than you do. Be careful choosing the boxes if you do decide to do this as you want your wedding candy buffet to look good all the time. Blue Candy Buffet You want your Wedding candy buffet to look impressive and to be part of your wedding. One way is to choose your candy by color, so if your wedding colors and pink your wedding candy will be shades of pink too. You can also add your favorite candy too. You will find that candy is cheaper is you buy in bulk and that mainly means buying online, but also check out your local stores such as Target to see what the bargains are. Another good reason to buy your candy online is that they will have the colors that you want and you will see candy that you probably have never seen before. JellyBelly.com - The biggest choice of jelly beans! Wedding Day MY M&M'S®M&Ms with your own words and photos! More expensive than regular M&Ms but for the true fan this could be just what you were looking for! A Candy Store - Loads of different colors and wholesale prices too. 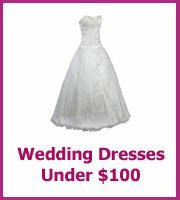 Koyal Wholesale is a fab online store as the prices are great and they have so much to choose from. Here you will be able to get everything you need for your candy buffet from jars, labels, scoops and most important is there is so much candy to choose from. As well as the candy you will also need containers to display the candy. Apothecary jars are popular as the shape of the jars are unusual and they add an extra dimension to your display. However buying lots of these jars for your candy buffet would be expensive so you may want to bulk out the display with cheaper jars or vases. 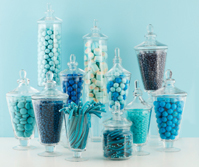 Creating different heights in your candy buffet makes the overall look more interesting. 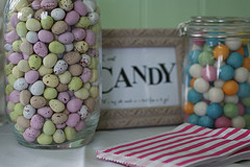 You could do this with large lollipops made into trees or have different height jars and containers. You will want a couple of larger containers for the most popular candy - Hershey, M&Ms and heart shaped candy always go down well. And then have smaller containers for the more unusual candy. Have a look around your own home to see if you have containers that you can use. 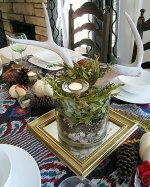 Glass containers are the most popular but you can also use tins, bowls and jars - all of which you could decorate with ribbons or lace to tie into the overall buffet look. Also have a look at wholesale suppliers, Ikea, TK Maxx and your local dollar store! Anywhere! You will also need scoops or tongs, plus paper bags or cones for your guests to fill. 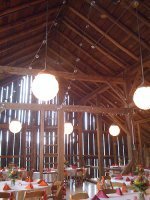 Choose an area of your wedding reception that is noticeable and easily accessible to your guests. It is a good idea to have your wedding candy buffet against one wall as it is easier to create a one sided display rather than a buffet that needs to look good on all sides. Use a white table cloth so your candy is shown off and if you need to create extra height in your display place boxes under the tablecloth so the candy jars are raised. Have the biggest containers in the middle of the buffet and then have the rest of the jars around these but not too close otherwise it is difficult to get the candy. Cookies, cakes, toffee apples, chocolate fountains (messy), cake pops and dognuts are alternatives to candy that look great and your guests will love them too. They are often referred to as dessert tables.